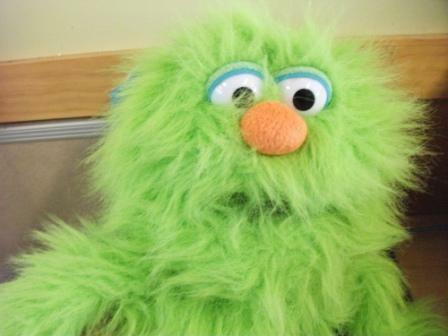 Please meet our classroom friend, the Alphabet Monster. 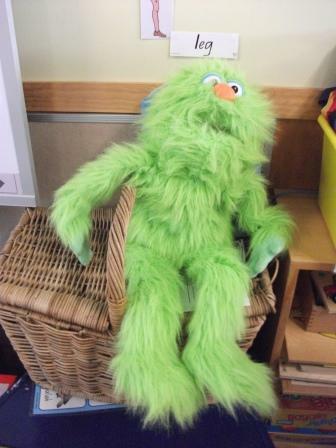 He is bright green, soft and fluffy, likes to hang around his basket in the classroom and teaches us about sounds. Every week in Prep we focus on a sound. We listen for and explore words that contain the sound, and learn how to form the letter that represents the sound. We gather objects from home and school that begin with the sound and put them in the Alphabet Monster’s basket. We put pictures of things that begin with the sound, on the wall above where our monster friend likes to hang out on his basket. All week we like to add things to his basket and build a collection of objects that begin with or contain the sound. Friday is the Alphabet Monster’s favourite day because he gets to reveal all the things inside his basket. 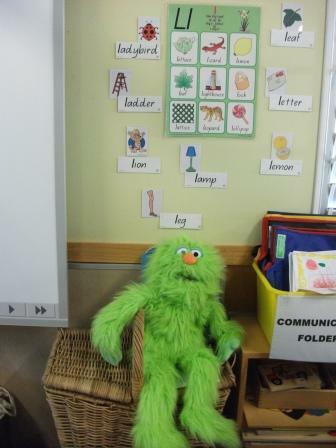 We all sit in a circle and the special helper of the day helps the alphabet monster take the things out of his basket and display them in the middle of the circle. 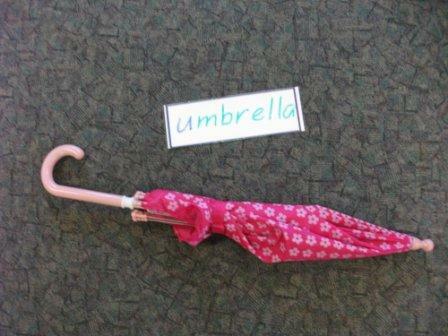 After an item is taken out we problem solve how to write the name of the item to create a label for the object. 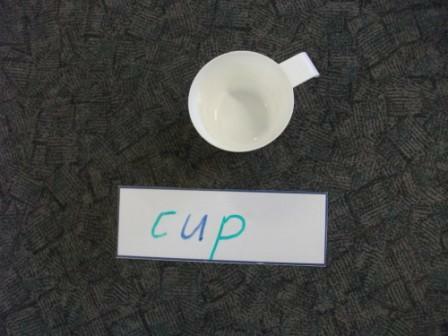 We discuss where in the word we can hear the sound and use a different colour to write the sound’s letter in the word. Some sounds are more challenging than others for collecting a large group of objects and sometimes an object begins with the correct letter but not the correct sound. We discuss these differences and learn about new sounds and new ways to represent sounds. For example unicorn begins with u but does not begin with the short /u/ sound and giraffe begins with the /j/ sound but begins with g not j. Thanks goodness the alphabet monster is wise and can teach us about these tricky concepts. After labeling all the objects, each child is given a divided peice of paper, selects an item, and takes it and the word to a table, copies the it onto their paper and draws a picture of the item. 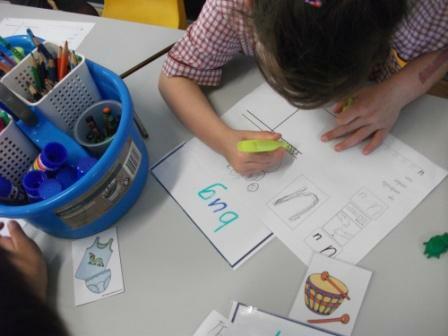 The children record 4 items and words that contain the sound on their paper, highlighting the letters position in the word and glue this into their sound book. 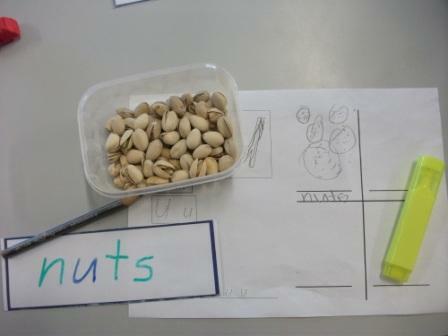 We also photograph the items to create a class sound book and record the text to assist us with the sound recognition. When we have to achieve mandated outcomes particularly in literacy, anything that makes our learning engaging and fun has to be a welcome addition to the classroom and that is exactly why our Alphabet Monster is such a favourite (and not to mention wise) member of our class. Although……… he is usually a bit grumpy every Friday afternoon because his basket is empty and he has to wait until Monday morning to collect and look after items beginning with our new sound.